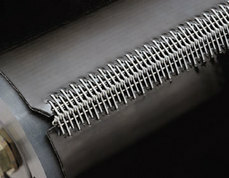 Clipper Belt Fasteners from Flexco are the belt fastener of choice in industry. 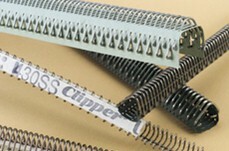 Clipper delivers performance, long life and easy installation. Clipper Belt Lacing maximizes belt availability and helps keep productivity on a roll. Clipper features quick, economical installation, low-profile fasteners, and a double-staggered-grip pattern that doesn’t degrade the integrity of the belt carcass Clipper belt fasteners operate quietly and interface seamlessly with conveyor components. Since its inception, the Clipper® Wire Hook System has earned a reputation for continued innovation and proven performance. Copyright © 1997-2018 Richards Company.